If it’s your first conference, I hope you’ll find some of these useful. Download the app and pdf ahead of time. Choose sessions on the app. Don’t worry about timing at first, just ‘star’ everything you’re interested in. This adds the starred session to the ‘My Schedule’ which you can access by clicking the top right of the app and selecting. If you’re not sure what a session is after reading the title, you can refer to the PDF (which you can find here!) Once you’ve starred everything that interests you, you can see if you have any clashes, or gaps, in your schedule. If you have clashes, you can refer to the programme PDF to help you decide which is best for you. Unstar the unsuccessful session to remove it from your schedule. For gaps, you can choose again from the available sessions at that time, or choose to wander around the job fair and booths. I prefer the second option, as it tends to be quieter when there are sessions in progress. Oh, and bring something to make notes with. Two years ago I was making notes on a limited number of post-its, and it wasn’t pretty. This might sound odd, but come with the mindset that while you can meet old friends, it’s good to be open to making new ones. I’ve met several people that have been friends of friends, that I now look forward to seeing at conferences. 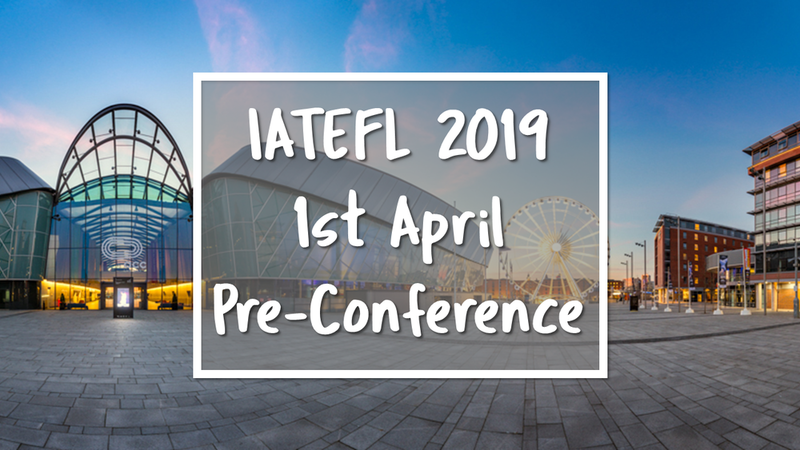 Whether it’s striking up a conversation in a session, or having a chat in a booth, half the fun of IATEFL is the serendipitous fun you can have. After all, anyone that makes the effort to get to IATEFL is going to have a lot of things in common with you, aren’t they…? Make the most of the job fairs and booths you see dotted around. You can walk around, see some of the latest Ed-tech and coursebooks, and check out the job fair. The poster presentations can be interesting (although often they can be a wall of text, but still interesting if you persevere). Be curious and explore everything! Be prepared for overwhelm. You’ll be thinking hard about lots of high quality input from presentations. You’ll be meeting old friends, and making new ones. You’ll be exploring Liverpool. Altogether, if you make the most of the conference, it’ll be quite intense. I’d suggest making some time for yourself where you can relax and unwind a little. You might designate an ‘evening off’ from socialising, or a long lunch break away from the conference centre. Whatever suits you. This one is optional, depending on your view of social media. I used to get annoyed by conference hashtags, but now I’ve found that they can add some value. You can discover when things are going on, and get perspectives on sessions that you weren’t able to attend. But if you see me, feel free to say hi in person! But What If I Can’t Attend IATEFL? Yes, I know I’m lucky to be able to attend. I’ve saved my pennies, and am able to take holidays to get here. If you’re not so lucky, some sessions are being filmed. The British Council are making them available on their site here, so get watching!